When you’re brand new to Tableau, it can feel like there’s so much to take in. 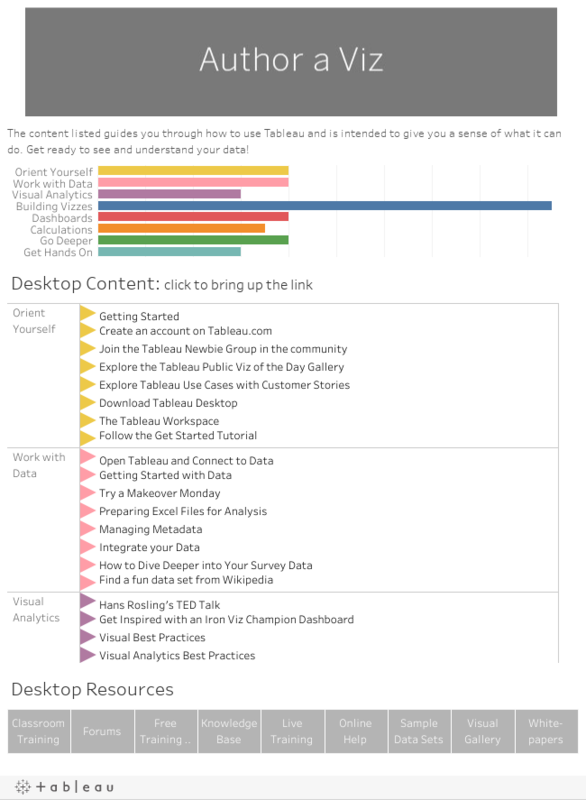 There are tons of resources to help guide your journey, whether you’re working with data in Tableau Desktop or exploring dashboards on Tableau Online. From whitepapers and webinars to Community Forums and Tableau Help, it can be hard to figure out where to start. I mastered Tableau by sitting down and reading or watching everything I could—and it worked! But it took a long time, and I wasn’t very organized about it. That’s where the Starter Kits can help. Pick a Starter Kit based on your role and platform, and explore a curated list of free resources. Are you authoring vizzes in Tableau Desktop? Consuming content in Tableau Online? Publishing to Tableau Server? Whatever your role, we have a Starter Kit for you. Each Starter Kit is broken out by topic, and the material spans the various types of resources available. If you find you prefer watching videos to reading KB articles, skip the KB and stick to videos. If you find yourself getting deeper and deeper into Tableau Help, explore it at will. Use the Starter Kits as a guide, and feel free to choose your own adventure. Soon you’ll know how to create bullet graphs, add logos to dashboards, and assign permissions to published content. You’ll be a Tableau viz whiz in no time. Visit our full library of Starter Kits, pick your flavor, and get started! AWESOME!!! I love pointing Tableau User Groups these to since they are so often a place where brand new users show-up looking for best approaches for getting started. Thank you! Very creative idea!